Last week, I watched the sun slowly climb into our bedroom windows until it filled them completely. I watched as that sun extended warm beams of light like open arms until they reached and wrapped themselves around her, a hug from the world on the day she was born. I looked at her now, more perfect than ever, and imagined her then in the beginning when her parents first thought the same. I’ve seen the pictures, the many pictures that accompany the first born of any family, and I’ve seen proof our lives existed before we found each other although it feels they never really began until then. I’ve seen the photographic evidence she once went through the stages herself that we take so much pride in watching our daughter transition through. 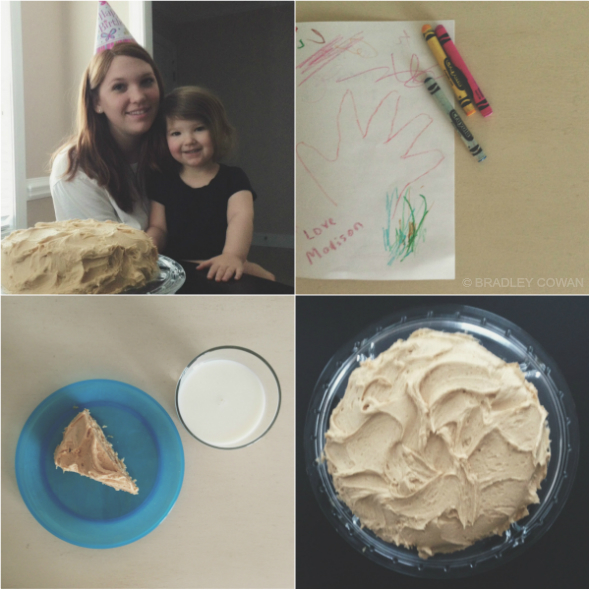 The beautiful strands of red hair growing longer with every candle added to her cake, the growth spurts, the lessons learned and taught along the way, every choice that turned her down a path that lead to where she is right now… with us. Once she made her way downstairs, Madison and I served a crystal cake dish holding peanut butter layers divided and covered in a peanut butter frosting as requested that we made from scratch the night before. A task Madison dreamed of since she fell asleep before the actual baking commenced, but it was a team effort nonetheless. Madison presented her with a card rivaling any of the designs a pocket on a store shelf has to offer and we poured ourselves cold glasses of milk while coffee brewed in the background. With that sun still shining through our windows alarming the world to begin their morning routines, we crowned her with a triangle hat displaying the message she would hear so often throughout the day and we hugged her just a little tighter and we sang. Happy Birthday, Allison. Happy Birthday, dear Mommy! Happy Birthday to you.